When you are blanketed with the season of get-togethers, and the soirées are only piling up, embrace the bling as your saving grace. Moving far away from minimalism and normcore, the festive season is about all things ornate, bejewelled, and bright. Choose a sequinned dress- you can’t go wrong with that, just make sure that its shimmer does not hurt the eyes. Keep your accessories light; the little amounts will do wonders to your look. Sure to light up your countenance, this piece saves the time-crushed diva from hankering by the wardrobe for endless hours. 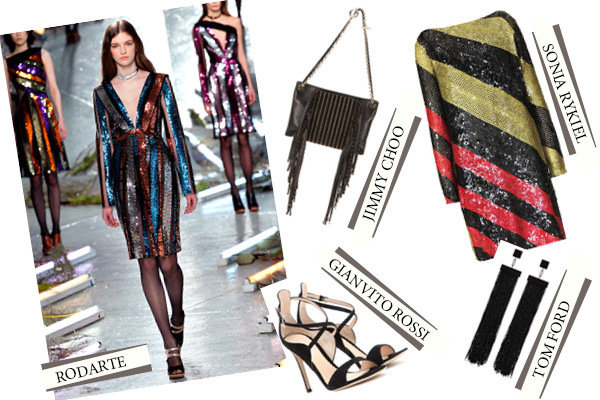 Find the products here: Jimmy Choo; Sonia Rykiel; Tom Ford; Gianvito Rossi.